Tradition (from latin, "traditio, -onis"): transmission, donation, made in speaking in general terms, of historical deeds, from one generation to the next, as it is considerated important to leave a legate to the younger generations. Esparto evokes warm and affectionate memories to the majority of elderly people, who resist the fast pace of life. Old days ... full of effort and hard work due to necessity and lack of free time. Nights facing children routinely crush two branches of esparto for their father. He always needed a certain amount of crushed esparto to pleat and repair his sandals (esparteñas). Work in the fields destroyed them every month. By the fireside people pleited the mats that helped against cold and gave some warmth to the floor. 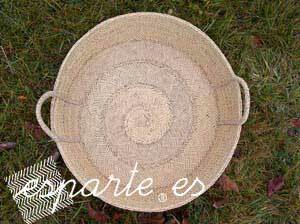 In a by-gone era of agricultural work, long winter nights allowed the plaiting of "capazos" (wide baskets) that went with the seeds and came with the fruits. At the same time came from the artisans hands, "tizneros" (to put the hot pan) and "baleos" (used to cleaning) that took hot migas (a mixture made of flour and water fried in olive oil) in rainy days. 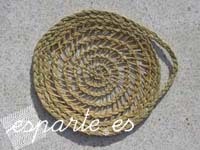 "Barjas" (esparto bags) were plaited to keep the treasure of lunch and meal to give energy during the hard working days. On the furthest corner of the cave were those "garrafas" (carafes) wrapped in fine pleita that contained wine from the last harvest. The pantry kept the "garrafas" with oil. What better, if not, than a good "bombona" (carafe made of glass, called so in the area Campo de San Juan) in its pleita! It was excellent to keep the oil waiting for the meeting with freshly baked bread. Near it were the other carafes with wide mouths, macerating olives with rosemary and thyme. On the kitchen table is the cheese, shaped in the pleita; it repairs weariness at dinner and helps to sleep well. And melons hung in "colañas" (wood beams that support a ceiling structure) in their "meloneros" (a little bag made of esparto to keep melons) waiting for the next Christmas. It were hard memories to think of going to harvest olives with mats! Twenty kg of olives were a dead weight plus 20 or 25 kg of esparto with the agravating thing that it was very uncomfortable to move the mats and nobody knew what was the best place to catch the mats. Aside the warmness of the fire they went weaving carpets which attenuated the coldness and contributed to give some warmth to the floor. 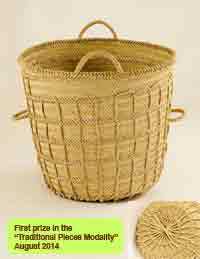 In the agricultural recess, the long winter evenings, allowed to weave or "pleit" large baskets, carrying seeds when it was time to sow, and carrying the fruits when it was time to harvest. Arised, likewise, among the craftswomen hands, "tizneros" and "baleos" that were keeping the crumbs hot on rainy days. "Barjas" guarding the treasure of lunch and food to replenish energy amid the intense work of the day. Work that was plaited in silence, with the soft light of an oil lamp, with the sacrifice of every day life, and with the shortage of facilities that were its warp. It was not casual the conversation I had with Ramón some years ago, in which he told me "Why do you need to plait esparto?, if you only knew..." It was an art and we didn't discover anything new. It was an art to manage to and accept living, although it was only because they didn't know anything else. It was an art and it doesn't belong to us, it is an heritage of mankind. Here you can see some works and its different uses. Also there is a short reference how to make some util tools. Esparto is an enduring, one meter length, perennial gramineae herb. Its leaves are persistant, radical, so rolled themselves that appears as edge shaped, hard, very tough, not fuzzy at all and about 40 to 60 cm. length. It has a loose, yellowish and branched out "flower". It grows in uncultivated, dry and stony lands placed in the center and the South of Spain and North Africa. Romans knew this plant and they treasured it for its high endurance and lasting. This curious piece was used to take the "recao" (lunch, dinner, meal...) It is a box with a cover to close it. The difficulty of this work is in the precision that needs the cover to adjust correctly to the box without being loose. "Tizneros" stained with "tizne" (soot from fire). Once the fire had cooked well the "migas" (a mixture made of flour and water fried in olive oil), the "tiznero" received the pan over it. 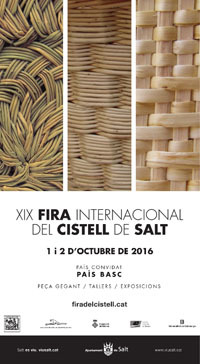 It is a solid work, because it is made of two turns of "pleita" (strip made with esparto leaves and that will define every work). The central drawing, as well as an artistic caprice, is necessary to give strength to the "tiznero". How many times have we asked ourselves where comes the tidy weft that wrapped cheese from? Here we have its unmistakable origin. 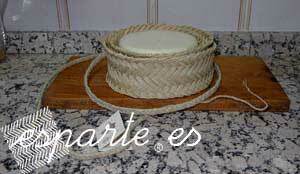 The careful order that gives craftsman to his "pleita" is passed to milk when it is pressed by curdle effect. Truly, this is a piece of work in recession. 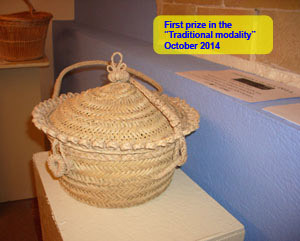 Hardly can it be seen in some ethnographic museum related to esparto. It was kind and well done to balance the burden and lighten it to the donkey. Some loaded dung in it some other potatoes, vegetables... And there it was up and down in workable days. Few preservatives and fridges needed our elders to preserve their food. They couldn't permit themselves to fail because hunger was there. The safest method to preserve the melon was undoubtedly to hang it in the chambers, or hanging it in the pine or perhaps sabina beams. 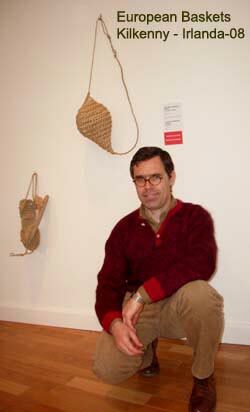 This is a work that you weave at once and without seams. You go on with some strands and you will collect the others when you finish. 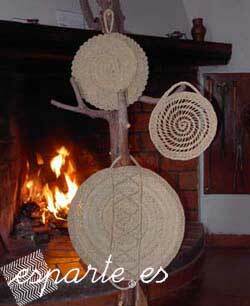 This big basket or "capaza" is one of the most useful esparto handicrafts for our people. Everything fit, it was filled with everything. The capaza is suitable to take it whith to the city. What a better suitcase than this, "ambassadress" of the rural beauty! 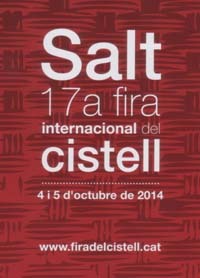 Today it is still used a lot in our villages and in the Murcia fields. A bottle or a fridge? Both of it. If you worry to keep the wrapping of the bottle in the hot summer evenings wet, this wet outside maintains the inner water cold. It is an esparto handicraft that is created around the bottle itself and is woven in one piece (without seams).It is habitual to strengthen the bottom to save it from breaking when it falls. This utensil is very typical in the Murcia region. It is 50 cm. diameter (currently). It was used to protect tableclothes for hot pans, but also to collect what the broom had swept. It was bent by its two handles and it became a "picker". It is also woven in one piece, from beginning to end. The same as with the bottle, they were used to maintain several liquids of daily life cool. Sometimes the wine from autumn harvest, other times the pressed and flavoured oil in the cold winter days. Even also to carry the water that mules transported. These are a bit complex pieces to weave, due to the size of the carafes. All of them are woven around the carafe itself. They always kept that well done piece, finished beautifully to decorate it. You could find fresh fruit, recent made bread, almonds or other autumn nuts in it. And it is so that esparto, as well as a useful material can be woven to appear as it is, a weft woven in a harmonious and tidy way to transmit endurance and beauty. Would this be like Little Red Riding Hood's basket? Could be perfectly, as there is space for eggs, honey, cakes, biscuits, strwberries and all kind of good things. The "soplillo" or "margual" was used to revive fire at fireplace. As the fire died down, starting to wave with the “soplillo” gave new oxygen to the fire. 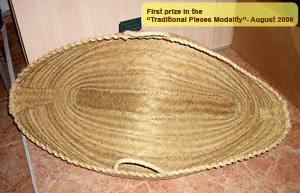 The jarpil is a woven mesh made of esparto grass that is used to collect and transport straw, herbs, or aromatic herbs. Sometimes it was carried on one persone's back and in other situations it was on a beast's. It is also named as "jalbegón" or "jabegón". 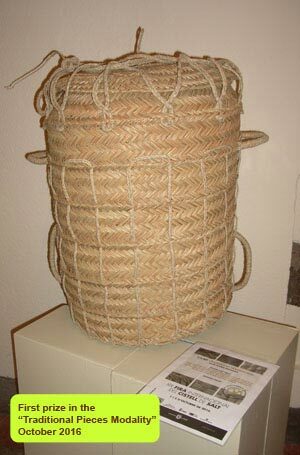 This large basket is used to collect olives, grapes and recently pistachios. En el centro de España y en el sur se utilizaba para recoger las olivas, la uva o incluso, actualmente, los pistachos. In some places it is also named "costal". This piece is used for picking and keeping the dry figs, like raisins. Some of them can contain even 500 kg. There was some flour between each layer of figs to keep them through all the year. "Cachuchos" are used to pick the olives. It was tied at the waist as container to deposit the olives during harvest. Once filled the cachuchos, the olives were transferred to a larger basket. Someone will think it is a new design, but no. 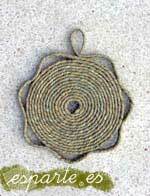 They are the ancient beehives that were woven with materials from the earth. This has been woven esparto "picao" on crude Esparto.. It is the natural habitat of bees where they make their life. The workers defend their entrance with a special designed piquera for them and so protect them from natural predators. It is a solid construction for some interesting and worthy insects to admire for their vital dynamics. 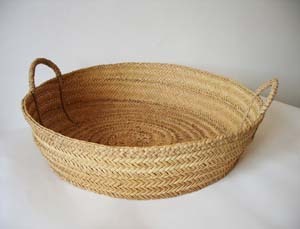 This big closed basket is still used in many areas of the Murcian territory, named "Campo de Cartagena" and " Fuente Álamo". 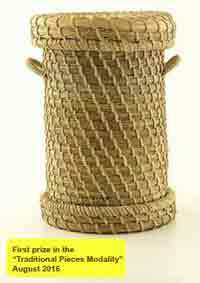 For its high consistency and resistence makes it possible that the basket can carry up to 55 kg of olives. These are the necessary tools to model the esparto fibre (Stipa tenacissima): A mallet and a trunk to crush the esparto leaves; some straight needles to sew the "pleita" and the "almaraz" to define seams. ...and the patient hand that sustains, bends and models the indomitable fibre. It is a work done in silence, with perseverance and exclusive dedication. The piece of work is unique and it is... grateful.